The first plasma in the Magnum-PSI experiment, Thursday 18 June. The plasma is a hot gas of charged argon ions and electrons. It disperses quickly in the high vacuum of Magnum PSI. Once the magnet system has been installed in November 2009, the plasma will form a dense beam that can be aimed at different wall materials to be tested for ITER. Researchers and engineers at the Dutch FOM-Institute for Plasma Physics Rijnhuizen have reached the second major milestone in the construction of the plasma wall experiment Magnum-PSI. They completed the construction of the full plasma source system with cooling, gas feed, control and data acquisition, power supplies and safety system. On 18 June, the first plasma was made in Magnum-PSI which showed excellent operation of the entire system. "This really is an achievement of the team as a whole. Everybody worked very hard on this, and the results are better than we hoped for," said project leader Dr. Wim Koppers. Magnum-PSI is a unique experiment, specifically designed to study the processes that will take place in the ITER divertor. This is the region in the fusion experiment where the hot plasma fuel will actually come into contact with a material wall. Magnum-PSI will allow scientists to create plasma conditions of their choice and use a range of wall materials. The effect of the plasma on the wall materials can be studied in situ with a variety of advanced diagnostic tools. It is the only experiment of its kind that will be capable of actually reproducing the plasma density, temperature and magnetic field expected in the ITER divertor. Earlier, researchers at Rijnhuizen demonstrated their ability to recreate these conditions in the Pilot-PSI experiment, a smaller forebearer of Magnum-PSI. 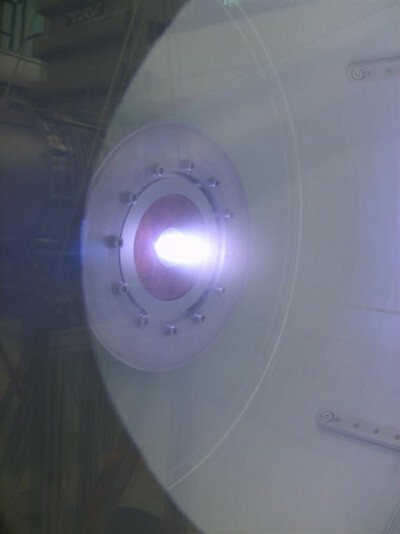 When finished, Magnum-PSI will feature a much wider plasma beam than Pilot-PSI. This will allow the study of the "strongly coupled regime," where eroded wall material will remain in the plasma and can chemically and physically interact with the wall and plasma. The third major milestone—the installation and testing of the superconducting magnet system—is scheduled for November 2009. At the end of 2009, the construction of Magnum-PSI should be completed and high-level commissioning and first experiments are expected to start early 2010.